We enjoy putting phones through their paces in our office, but as a manufacturer, Samsung too subjects its phones to a host of reliability tests before launching them on the market. And it’s a different type of tests, mind you. A Samsung made video gives you a rare glimpse behind the curtains of their test facilities. It’s a video ad, that’s alright, but none of these tests seems staged. I’m sure most (if not all) Samsung phones go through stringent testing procedures like these (even employing the help of “I sat on my phone” buttocks dummy). Key press tests, USB socket rigidness, twisting and flexing, abrasive action by vibrating foreign objects, and even rain – it’s all there. Here’s the video itself, and while it’s all in Korean, it’s pretty self-explanatory and hardly needs a translation. Tip: the real action starts from 0:52. 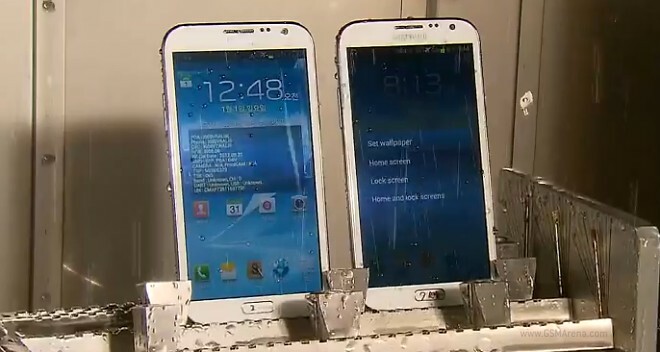 From 2:50 onwards another Samsung phone gets sprayed with water. It’s hard to tell which one, but I’d guess it’s the Samsung Galaxy Rugby Pro for US AT&T.